Blouse with short-sleeved knitting patterns on the schemes. 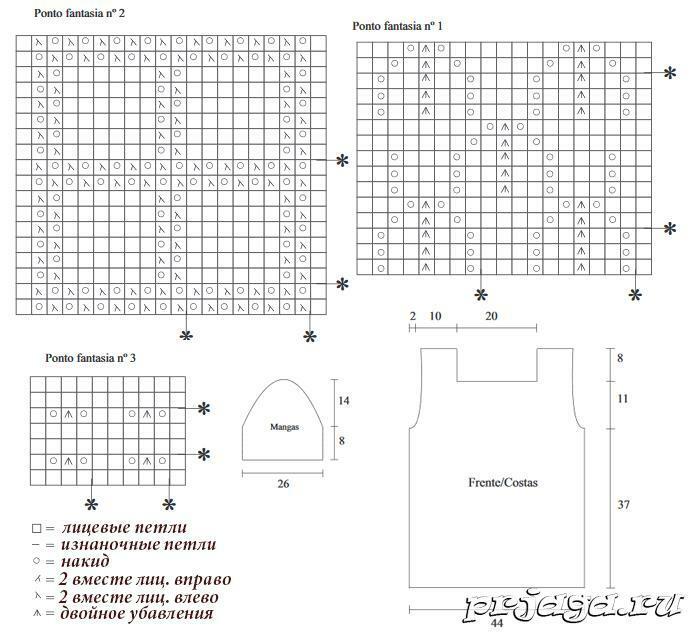 Knit with a pattern according to scheme 1. Repeat the rapport between * - * schemes 3. At a height of 37 cm. a row 2 loops - 1 time and 1 loop once again. At a height of 48 cm. Close the central 32 loop for the neck. At a height of 56 cm. Close the shoulders. Sleeve: dial 46 loops with the needles number 4.5. Knit pattern 1, starting from 3 persons., Then repeat the pattern of 10 loops 4 times and finish 3 persons. At a height of 8 cm. Close each loop in each second row 1 loop - 15 times. Assembly: sew the shoulders and sides. Sew in the armholes of the sleeves, complete the seams of the sleeves. Hook to oblige the neck slychim step.